Porcupine Mountains Wilderness State Park - WE DONE IT! Map of the location of the Porcupine Mountains Sate Wilderness Park and our route from SE Wisconsin to the park about 375 miles north. Map of the route of our 24.4 mile hike. We started in the north east, at the beginning of the Government Peak Trail. Headed southwest around the end of Lake of the Clouds. From there we traveled further southwest to where Big Carp River dumps into Lake Superior. Next we traveled along Lake Superior northeast and then back to the starting point. Most people have either never heard of the Porcupine Mountains Wilderness State Park in the western Upper Peninsula of Michigan or have no idea where it is located. It is a relatively small area in the Ottawa National Forest about 160 miles east of Duluth, MN on Lake Superior. It is 375 mile drive from our home in south east Wisconsin. But the approximately six hours of driving gave my son and I lots of time to talk! I especially enjoyed it since he did all of the driving both ways. Our trip began at 5:00am on Thursday, May 4, 2017 and ended back home at about 8:00pm on Sunday, May 7th. A curious little tidbit is that the park is in the Eastern time zone even though Wakefield, MI, just a few miles south is in the Central time zone. 2017-05-08 ​Yesterday morning I awoke about 6:30 in a hammock on the shore of Lake Superior in Michigan's Porcupine Mountains Wilderness State Park. 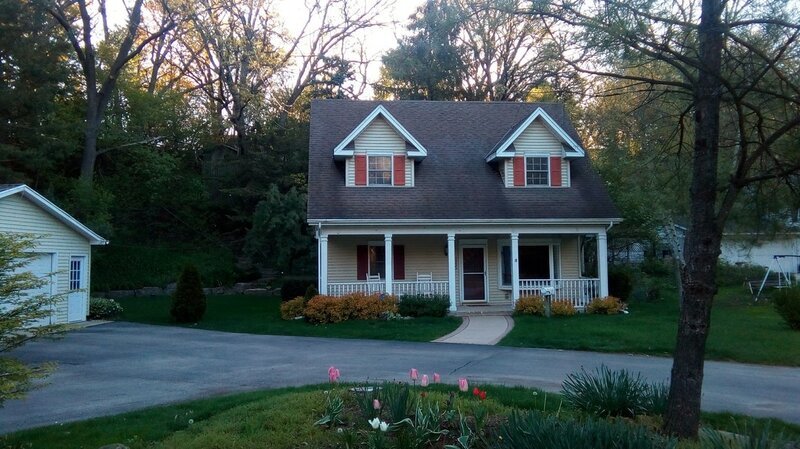 This morning I awoke about 6:30 in our lovely home just a block from the shore of Bohners Lake in Burlington, Wisconsin. It was about 27 Yesterday morning. It's 35 here this morning. Yesterday the sun was streaming through the tops of the tall leafless trees of the forest and the white-capped waves of Lake Superior were lashing the rock-lined south shore. Today the sun is shining into the tops of the half-leafed huge oak trees that cover the hill immediately behind our house. Yesterday our son, John, had just finished heating water over his Jetboil stove and handed me a cup of Starbucks instant Via coffee. This morning I pushed the button of our coffee maker (after adding the grounds and water last evening) and just now poured a cup of steaming coffee. Yesterday morning I took down my hammock, packed my backpack (along with our two sons John and Charles) and headed down the trail, up the ridge, through shallow water trickling down the foot path, up steep climbs, down steep declines and after about two hours ended up at the road to get in the car and drive home. This morning I made our bed, walked outside to take this photo of our house and sat down here at the computer to type this paragraph. But both days I awoke in the presence of loving family: my wonderful two adult sons in adjacent hammocks, John and Charles yesterday. This morning alongside my beautiful, lovely and amazing wife, Sharon, of 52 years (in just a few months). But above all, both days I awoke, aware of and thankful for the gift of peace with God, the creator who loved me (and you) and gave his Son, Jesus. "Hanging" with my sons on the south shore of Lake Superior in the Michigan Porcupine Mountains Wilderness State Park. Thinking about what made the last two mornings (and every morning) so special, though so very different, I've come to a conclusion: Both mornings, I was with those I love and who love me! Whether in the exposed and relatively uncomfortable outdoor cold and damp of the north woods, or in our warm and cozy house here in southeast Wisconsin, both were filled with joy because I shared them with people I love! Thank you, John and Charles and Sharon, all the rest of our family and Jesus for your presence and love! Life would be empty without YOU!!! 2017-04-27 Well I've packed, unpacked, repacked.... Tossed out some things, exchanged some things... And my pack still weighs 38 obs with 1-3/4 liters of water, food, clothes.... The only way I can think of saving noticeable weight would be to go out and buy 20 degree down bottom and top quilts to cope with the night time temperatures projected to be in the mid to lower 30s. Or perhaps I am jut too concerned and should leave the 2 lb sleeping mat at home and just go with my 35-45 degree quilts. Daytimes will be perfect, in the mid to upper 50s. 2017-04-19 The planned route of our hike in the Porcupine Mountains Wilderness State Park in the UP of Michigan is shown in the hike overview map at right. We'll start at the upper right corner where the Government Peak and Escarpment trails come together and hike west to Lake of the Clouds. The Escarpment trail (see Escarpment Trail map below) is just over 4 miles long and since we'll be starting out about noon we are hoping to camp along the trail or at Lake of the Clouds the first night. 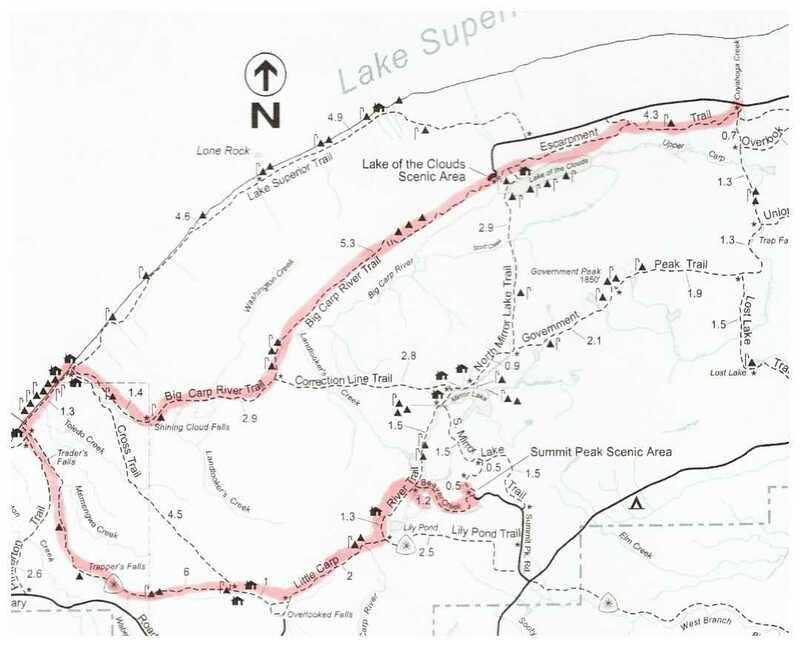 The second day we plan to hike the Big Carp River Trail (see the Big Carp River Trail at right) which joins the Escarpment Trail at Lake of the Clouds and continues west to Lake Superior. Total length of the Big Carp River Trail is 9.6 miles. Depending on how the day unfolds and where we can find an open campsite, we hope to camp in the vicinity of Shining Cloud Falls the second night. Porcupine Mountains State Park Hike Overview map. "a walk in the park" or be completely impassable. So the decision about taking that trail may be made last minute based on input from Rangers or our own experience. The alternative would be to take the Cross Trail which starts at the junction of the Big Carp River and Lake Superior trails. It then connects to the Little Carp Trail, hopefully past those troublesome crossings. Once again, depending on conditions we face our plan is to camp part way along the Little Carp River Trail. The Little Carp River Trail, which includes a section of the North Country Trail, is around ten miles long. Where we camp the third night will be determined based on our progress and which trails we take. The 4th day we'll complete the distance from our third night campsite to Summit Peak Scenic Area where we will have left one of our cars. So that's the plan! Of course reality may be something different but likely at least similar. We're getting excited and just hoping it is not too cold or rainy. End of trip at Summit Peak Scenic Area. 2017-03-07 I think I've made up my mind about the hammock setup for the Porkies Hike. We'll each carry a hammock with mosquito net, tarp, under quilt and sleeping bag or top quilt and a sleeping pad. That gives us options. If temperatures drop into the low 30's or lower we'll use both the under quilt and sleeping pad. If in the 40's or above we can choose either the under quilt or the sleeping pad. And should fortune fail us and ground sleeping were needed, the sleeping pad and tarp would suffice. A complete setup will weigh approximately 8 lbs. 2017-02-16 My son and I are planning a backpacking trip in the Porcupine Mountains Wilderness State Park in the UP of Michigan in May. The exact date has not been set yet. Since I am coming from Wisconsin and he from Minnesota the plan is to meet Thursday afternoon and leave one car at the Summit Peak Scenic area on the south side. (Click here to see a trail map) We will then drive the other car down to the beginning of the Government Peak Trail on M-107 on the north side. From there we'll hike a short distance west toward Lake of the Clouds on the Escarpment Trail and camp Thursday night. Friday we'll continue on the Escarpment trail west and connect with the Big Carp River Trail near the west end of Lake of the Clouds, continuing on to hopefully camp near the Shining Cloud Falls near Lake Superior. Saturday we plan to continue on the Big Carp River Trail to Lake Superior and then west the short distance to the beginning of the Little Carp River Trail. We would then hike the Little Carp River Trail up to the Summit Peak Scenic Area. We are considering whether to hammock camp on this trip. We've tent camped on all previous trips. The Porkies also offers the option of staying in some of the rustic cabins or Yurts there which might be interesting. Lots of things to sort through, including the precise dates but we are actively discussing various options. At this point in our research the only potential significant obstacles I've seen are the two river crossings on the Little Carp River Trail. From what I've seen in writing it appears those can vary from rock hopping to impassable due to the raging, deep waters. Having a long time and very hiking experienced friend drown in a raging river in Canada last year makes me a bit squeamish about river crossings.